After I figured out the appropriate DNA and primers to use to detect gDNA in Crassostrea gigas samples, I checked Ronit’s DNased ctenidia RNA (from 20181016) for residual gDNA. BB16 from 20090519 was used as a positive control. In the plots below, green is the positive control, blue are the samples, and red is the no template control (NTC). Everything looks great! Nice, clean, gDNA-free RNA! Will proceed with reverse transcription. This entry was posted in Miscellaneous and tagged cfx connect, Crassostrea gigas, ctenidia, dessication, diploid, DNased RNA, EF1_qPCR_3', EF1_qPCR_5', Pacific oyster, qPCR, SRID 309, SRID 310, SsoFast EvaGreen Supermix, triploid on 17 October, 2018 by kubu4. Well, this primer set and/or the gDNA is not good. In the plots below, the positive control gNDA is in green, samples in blue, and no template controls (NTC) are in red. 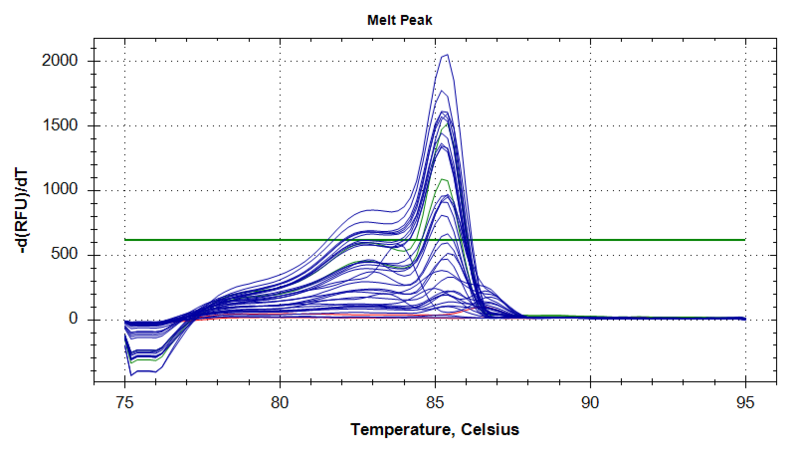 Poor performance is most easily noticed when looking at the melt curves. They have multiple peaks, suggesting non-specific amplification, even in the positive control. Additionally, although less evident from just looking at the plots, is the replicates are highly inconsistent. Although it’s possible that might be due to poor technique, it’s very unlikely. Will have to identify different primers and/or positive control DNA. This entry was posted in Miscellaneous and tagged 18s, BB15, cfx connect, Crassostrea gigas, dessication, diploid, DNased RNA, gigas18s_fw, gigas18s_rv, Pacific oyster, qPCR, SRID 157, SsoFast EvaGreen Supermix, triploid on 16 October, 2018 by kubu4. Received DNased pinto abalone RNA from Alyssa Braciszewski at UC-Irvine. These are subset of the samples I sent her back in February. The samples need to be confirmed to be free if residual RLO gDNA via qPCR. If they are clean, then will proceed to making cDNA, using provided reagents. Reagents were stored in door of -20C in FSH 240. Samples were stored in the provided box in the “new” -80C in FSH 235. This entry was posted in Samples Received and tagged DNased RNA, Haliotis kamtschatkana, pinto abalone on 13 September, 2017 by kubu4. I previously DNased RNA I isolated from water filters that were part of the RLO viability experiment that Lisa and the Capstone students are conducting. I checked for residual gDNA carryover via qPCR and all of the samples that were intended for dosing the abalone came up positive. It’s likely due to such a high quantity of algae that was co-filtered with the potential RLOs, leading to over-saturation of the RNAzol with DNA, resulting in the gDNA carryover. In turn, I think the DNase treatment was insufficient for the quantity of carryover DNA. I am planning on re-DNasing those samples, but want to quantify any residual DNA present to make sure that the samples aren’t still too concentrated for the DNase. Samples were quantified using the Robert Lab Qubit 3.0 and the Qubit dsHS reagents (high sensitivity), using 1uL of sample. Residual DNA is still present, but at levels that are well below the maximum that the DNase treatment (10ug) can handle. I will redo the DNase treatment on these samples. Spreadsheet is linked, and embedded below, with sample concentrations. This entry was posted in Miscellaneous and tagged DNA Quantification, DNased RNA, Qubit 3.0, Qubit dsDNA HS on 24 April, 2017 by kubu4. Need to verify that the DNased RNA I made previously does not have any detectable gDNA present. Ran the withering syndrome qPCR assay on the DNased RNA. All samples were run in duplicate. As such, the number of samples required to qPCR runs. Baseline threshold was manually set to 580, as previously determined by Lisa. Well, some samples came up positive for residual DNA. The samples that came up positive are all three dilutions of the RLO used for initial infection of the abalone. This makes things interesting to deal with. Seeing that no other samples have detectable DNA suggests that those samples are fine to move forward with for reverse transcription. However, it’s unlikely that the DNase treatment only worked on a subset of a samples, since it was distributed via a master mix. This entry was posted in Miscellaneous and tagged CFX96, DNased RNA, GoTaq qPCR Probe Master Mix, p18RK7, qPCR, WSN1 on 6 April, 2017 by kubu4. The RNA I isolated earlier today was subjected to DNase treatment using the Turbo DNA-free Kit (Invitrogen), following the manufacturer’s standard protocol. After DNase inactivation treatment, the RNA was transferred (recovered ~19uL from each samples) to a clear, low-profile PCR plate. The samples will be subjected to qPCR to assess the presence/absence of residual gDNA. The plate of DNased RNA was stored @ -80C in the original box that the water filters were stored in. This entry was posted in Miscellaneous and tagged DNase, DNased RNA, Turbo DNA-free, water filters on 9 March, 2017 by kubu4. Performed reverse transcription on the DNased RNA samples that I verified were free of detectable RLO DNA (20161207). Combined 17μL DNased RNA + 0.5μL random primers (Promega; Cat: C1181) in 0.2mL PCR tubes. 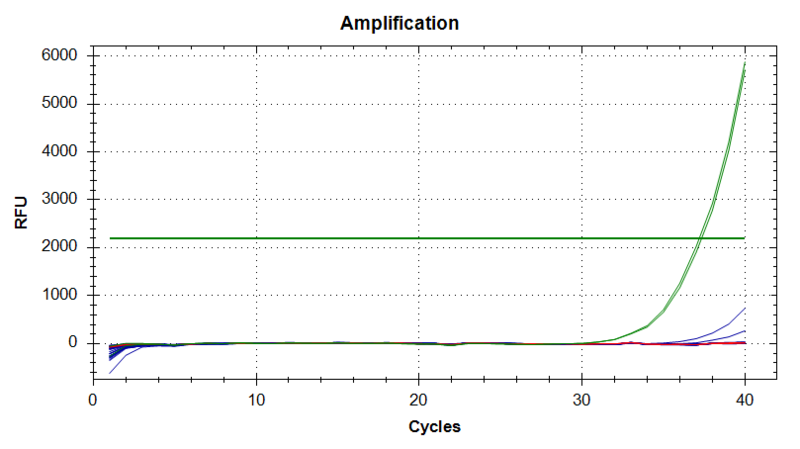 NOTE: The 17μL was virtually all of the sample volume recovered from DNasing. As such, the DNased RNA will not be quantified. Incubated DNased RNA and primer mix in PTC-200 thermal cycler (MJ Research) at 70C for 5mins w/heated lid, then immediately placed on ice. Added 6.75 of master mix to each and mixed by pipetting. 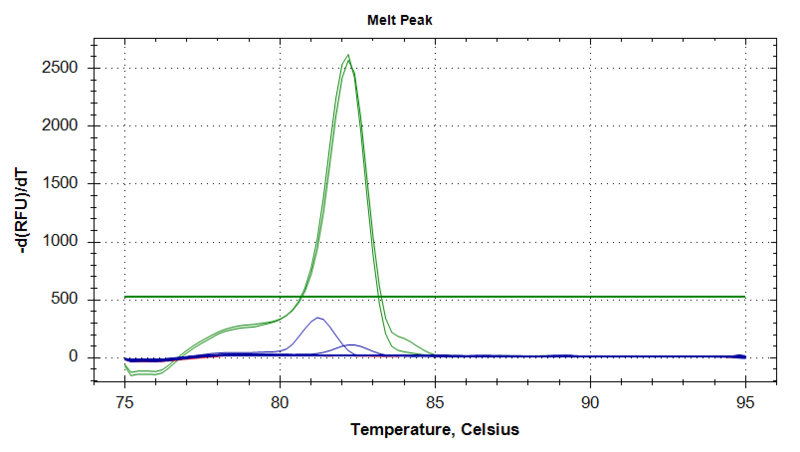 Incubated PTC-200 thermal cycler (MJ Research) @ 37C for 1hr (no heated lid), followed by 95C for 3mins (heated lid). Samples were transferred to 0.5mL snap cap tubes and labelled with “cDNA” and the corresponding sample name. Samples will be stored in my -20C box. UPDATE 20170830 Lisa has moved these samples to a -20C box dedicated to RLO Viability cDNA. This entry was posted in Miscellaneous and tagged cDNA, DNased RNA, M-MLV RT, PTC-200, random primers, reverse transcription, RLO, RT on 8 December, 2016 by kubu4. 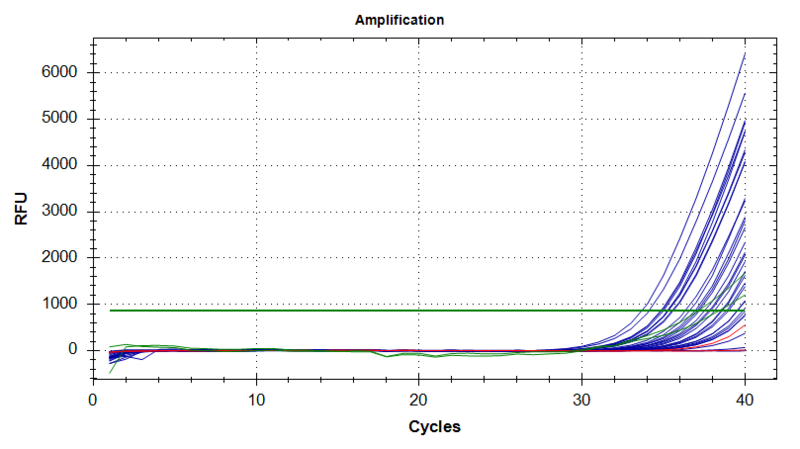 Prior to creating cDNA, need to verify that the DNased RNA from earlier today doesn’t contain any detectable RLO DNA. Standard curve was the p18RK7 curve made on 20161128. No samples amplified. This suggests that there is no detectable DNA in any of the DNased RNA samples. Will proceed with making cDNA. This entry was posted in Miscellaneous and tagged CFX96, DNased RNA, GoTaq qPCR Probe Master Mix, p18RK7, qPCR, RLO, RLP_p, WSN1 on 7 December, 2016 by kubu4.